… Juliet & Company earrings! After including these earrings in several posts over the past month, I just knew I had to have a pair of my own. They’ve been the perfect add-on to plenty of looks lately (turqouise earrings go with nearly everything, don’t you agree?). The shape is right on, and, though they look like the kind of earrings that might weigh you down, they’re actually very lightweight. Even better? They’re under $50.00 … which means I might just need one more pair. Perhaps, the coral color will do the trick? Super cute Bradley- love the color on you! Those earrings are near perfection! I love them! love love love them! I want a pair of the coral ones too! I have these too! Love them! 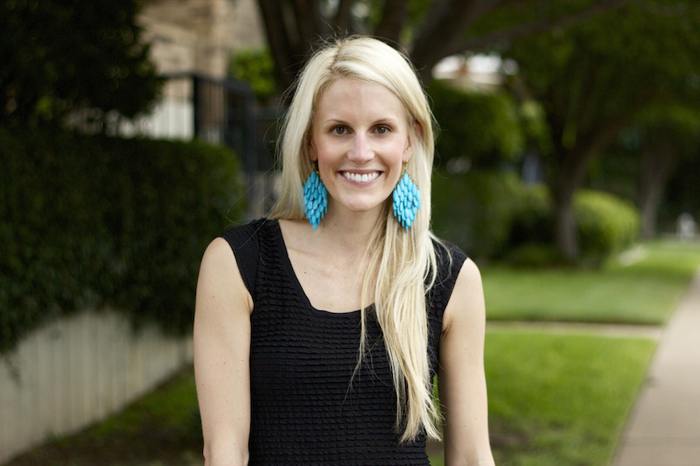 i love the pop of turquoise against your black shirt and blonde hair- stunning! Ah love those. I need new earrings! Amazing color on you Bradley! Just beautiful! Gorgeous..love the color it really pops against the black. You look beautiful. Those earrings are gorgeous! They are a great color to pair with black and make it more summer-friendly. Totally agree, turqouise does do with everything! !